A good fence requires a solid installer with years of experience. Our professional team of fencing specialists at Roots Landscaping is ready to help you with your fencing and landscaping needs. We have an accomplished background as a fence contractor and a large array of fencing projects that we’ve completed in the area. The lovely city of Bethel continues to be one of our top markets. You’ve probably seen one of our fencing projects on your daily commute around Bethel. There is an infinite selection of fencing to choose from for your specific needs. First you may want to consider what your fencing needs are. Do you need a fence for the safety of your children and pets? Is privacy your main goal or is it a security issue that will give you peace of mind? Whatever your reason for wanting a solid and secure fence, Roots Landscaping is the fence company you need to assist in completing any and all commercial and residential fencing projects. 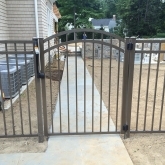 A fence that is properly installed by an experienced team of professionals can ensure you don’t encounter any unexpected issues that could possibly delay a timely installation. A professional can also evaluate your needs and area to prevent future damage to your investment. After our team has consulted with you about your specific needs, they can assist you with finding the correct type of fence best suited for your land. Roots Landscaping will complete a full measurement around the area, evaluate the topography, and guarantee your fence is properly installed. 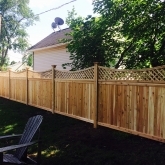 Costs can differ depending on the material you choose, the height of the fence and its length. Do you have an old fence that needs repairs? The experienced team at Roots Landscaping will make sure your current fence is properly cared for and upgraded where needed. We will help you determine the problem, why it has occurred and the type of repair required for a long term fix. One of the most common problems in fences is wood damage caused by rot. The slow decomposition is caused by fungi that attach to exposed wood and begin to eat away at the lumber. 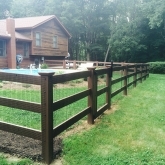 After the wood has been chemically treated, stained or patched and repainted, you can enjoy years of a solid fence. If the wood has become too rotted to be structurally sound, sections of the fence may need to be completely removed and replaced. For repairing or replacing a wooden fence that has been damaged over time, we are Bethel’s preferred fencing contractor. 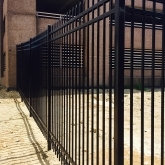 Fence poles that provide the structural stability of the edifice can naturally shift over time. A large part of a fence can be brought down by just one falling or deteriorating pole that was neglected and needed to be replaced. Regular maintenance that includes replacing fence poles and repairing them will help you to preserve your fence. The process of repairing holes and cracks will vary depending on the material of your fence, from vinyl, covered aluminum, chain, wood or other building material. Keep your fence in its best shape and prevent bigger problems by patching holes and filling cracks. 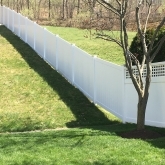 A typical fence repair is a missing board. Due to the type of fence, length of board and fence height the repair process varies. Fixing boards in a timely manner is important in order to prevent fence collapses, which can be a much costlier expense. 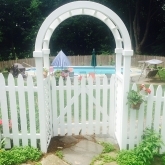 Call Roots Landscaping today to learn more about how we can help you repair your fence! 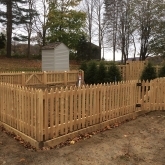 Roots Landscaping provides superior fence installation, expert masonry, structural repairs and supplementary landscaping services in Bethel, CT. 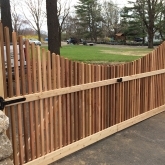 If you are uncertain about the type of fence you need, or have questions about the project you hope to complete, contact Roots Landscaping today. We can be contacted at 203-304-7326.